The Team (from left to right): Scott, Jim, James, Juliane, Barbara, Brian, John, Ioannis. 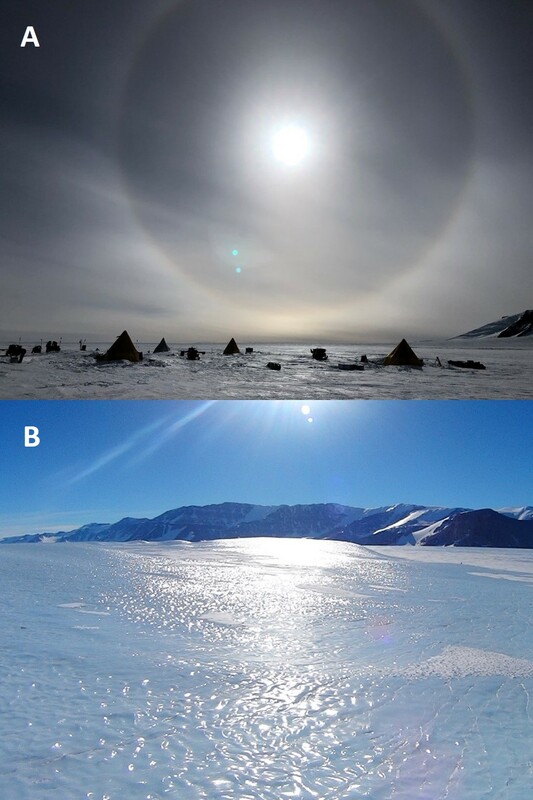 Antarctic Beauty: a) Sun halo over the field camp of Team A at Mt. Cecily. b) Field site of Team B at gorgeous Amundson Glacier. Blog-Tsar Scott (left) and Blog-Tsarina Juliane (right). Our last bit of cargo and the last 4 skidoos have finally arrived and with that our season is over. 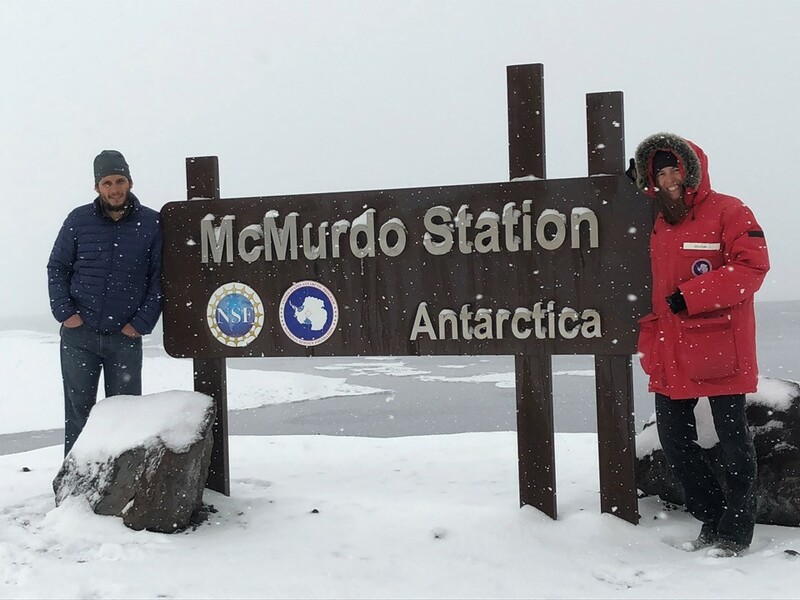 We are still in McMurdo waiting our turn to leave the continent (whenever it might come, still no flights out of here). The cargo vessel departed this morning and the fuel vessel has arrived in its stead. It carries all the fuel McMurdo and South Pole Station need for the next year. We have done all the hikes and tours, all the volunteering and wandering around and since there isn’t much else to report on we are taking the time now to say goodbye and end the blogging. Thank you everyone for reading our blogs, sharing our experiences, and being with us in thought. The past +2 months have been an incredible journey and in a few weeks we will all be home again. It all started with the ANSMET bootcamp in Cleveland that helped us prepare for the adventure of our life-time and made us so much more confident going into it; it bonded our team of 8 (+Ralph) together before we even left for Antarctica and gave us a fantastic idea of what to expect and how to prepare for it. Life in McMurdo in the beginning of the season seemed quite crude, rough, minimalistic, and very very simple. Life in McMurdo after being back from the deep field seems like a luxury spa with running water, hot water on demand, tropical temperatures of -8C, a small soft bed to sleep in, meals prepared and dishes washed by someone else, a warm barrack (which also serves as a bar) to play cards inside, or shuffleboard, or darts, or pool (if the table is free), or just to hang out with all our teammates and newly made friends. Experiencing the deep field of Antarctica with its Beauty and its Beasts, with our wonderful teammates who were with us in coldness, tiredness, hunger, and frustration but more importantly who shared with us all our happiness and joy, all that has changed us and our perception, it has taught us to simply appreciate the little things in life. In the deep field we experienced the powerful forces of Antarctica, traveled a total of 332 miles on skidoos, our bodies changed in the cold, we stuffed our faces with butter, chocolate, and peanut m&ms that it could last a lifetime and yet we lost weight. We ate self-made vanilla ice cream made with Antarctic snow and drank tea made with Antarctic glacier ice that is thousands to millions of years old. We laughed so much together and comforted each other on bad days. 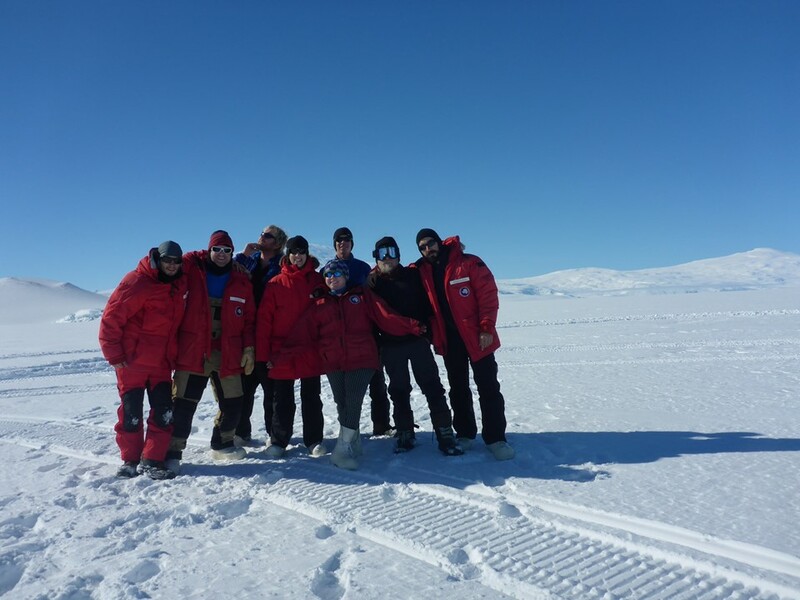 In the deep field we have learned how to embrace the hardship and harshness of Antarctica and how to turn them into memorable moments of joy and fun that we will never ever forget again. I for one will never forget the beautiful bell-like sounds of the blowing snow, the rainbow-sparkling ice crystals on a really cold day, the vast expanses of ice sheets looking like oceans frozen in eternity, the force and strength of the howling winds ripping on our clothes, the funny shaped, icy snotcicles hanging off our frozen noses and beards and that made us laugh and turned us into ice monsters, and the icy bite of the wind on any unprotected skin that made us feel so alive and reminded us how vulnerable and precious life really is. I will never forget the incredible taste of simple foods (and food combinations) like peanut butter or cheese topped with pesto and honey, or how a small piece of fresh fruit like a little apple can become your most treasured possession in your life that makes you happier than anything I can think of. I will never forget the cramped yellow Scott-tents that became so very much of a secure, cozy, little home to us, our warm sleeping bags that were our comfortable and dark caves in 24 hour bright sunlight, the long conversations and discussions with tent- and teammates about books, politics, movies, and life experiences, the fun science experiments and little personal adventures we undertook, and all the traverses, hikes, and tours we did in this breathtaking environment. I will never forget the lazy circles the sun made in the sky, shining for us 24 hour a day, the unimaginable quietness on a windless day, the noisy whiteout blizzards that made us feel like we were trapped inside a Ping-Pong ball. And I will NEVER EVER forget the thrill and utterly joy of finding a meteorite that you know no one on this planet has ever seen before you. And so in the end we are simply grateful for the opportunity given to us to participate in the ANSMET program and to give back to the science community by increasing the worlds collection of meteorites by 263, which are available to all scientists on this planet to study; we are grateful to NASA for funding this program and for all the incredible people and personalities we got to meet and got to know, who supported us and our science goal in McMurdo and Shackleton Glacier camp. We are grateful for the Twin Otter pilots who fly in crazy conditions to bring us much needed re-supplies or to pull us out of the field in bad weather; we are grateful for all our families, friends, and loved ones who let us go on this adventure and everyone who was with us in thought. And we are most grateful for each other, for the help, the guidance, and the friendship that we all gave to each other with pleasure. Life is full of hardship and surprises and Antarctica has taught us how to see beauty in every beast. That I will never forget. So for now, goodbye friends, and thank you all for letting us share our incredible journey and our experiences with you. Fare well, Antarctica, it still is and has been magical! P.S. : I’m thinking of you, Katanya, and send you lots of love and strength. I can’t wait to hug you when I’m back!